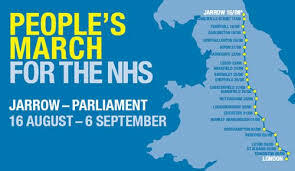 March for the NHS – Nottingham details 28/29 August. Like much of the welfare state, the NHS is being privatised by stealth. Huge amounts of NHS work is being offered, and has already been allocated to, private contractors. Campaigners are now marching from Jarrow to London to highlight the privatisation of our health service. The March comes into Nottingham (from Mansfield) on 28th August – and arrives at the Forest Recreation Ground late afternoon. From 5.30-7.30pm there is a welcome reception and rally. UCU members are urged to attend. The fight against privatisation is common to us all. Details of the Notts sections of the March (arrival and departure) are here – please contact Stuart Halforty (Nottingham co-ordinator) for more information. The march sets off from Nottingham the following day at 10am (from County Hall) and marches 15 miles to Loughborough. Many Notts figures support the March – read Notts MP Gloria Del Piero’s article in the Evening Post here. This entry was posted in Uncategorized and tagged Campaigns. Bookmark the permalink.